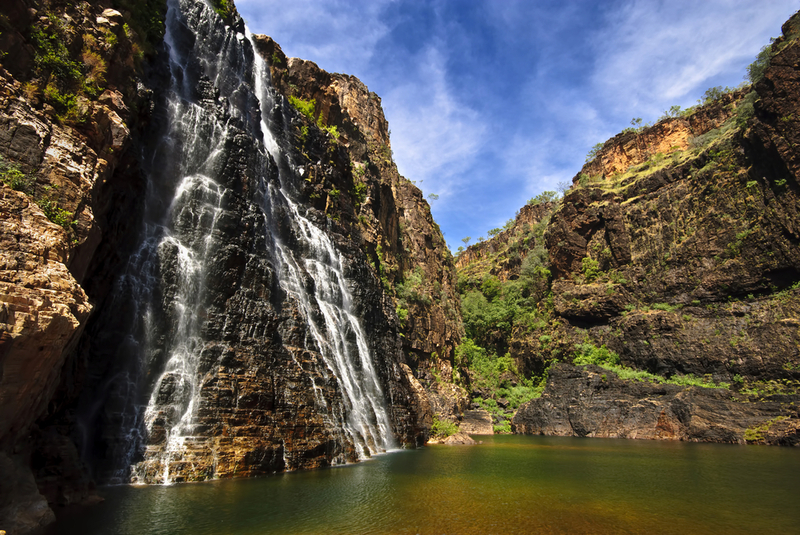 The 5 Day Kakadu Koolpin Gorge Safari explores Kakadu National Park at it’s best. 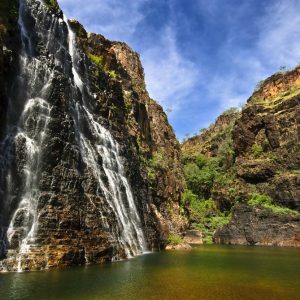 The tour visits the special permit area of Koolpin Gorge as well as Jim Jim Falls, Twin Falls, Barramundi Gorge (Maguk) or Gunlom Falls and Ubirr Rock. 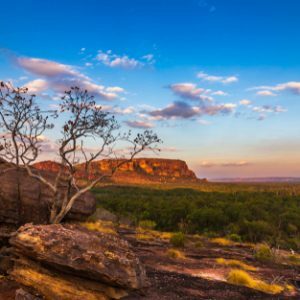 This is a great tour for the dedicated adventurer. This is a small group tour with a maximum of 9 guests camping in tents and swags and travelling in a 4 Wheel Drive vehicle. Tour requires a good level of fitness and is recommended for 12 yrs. This tour is suitable for the more fit and active. 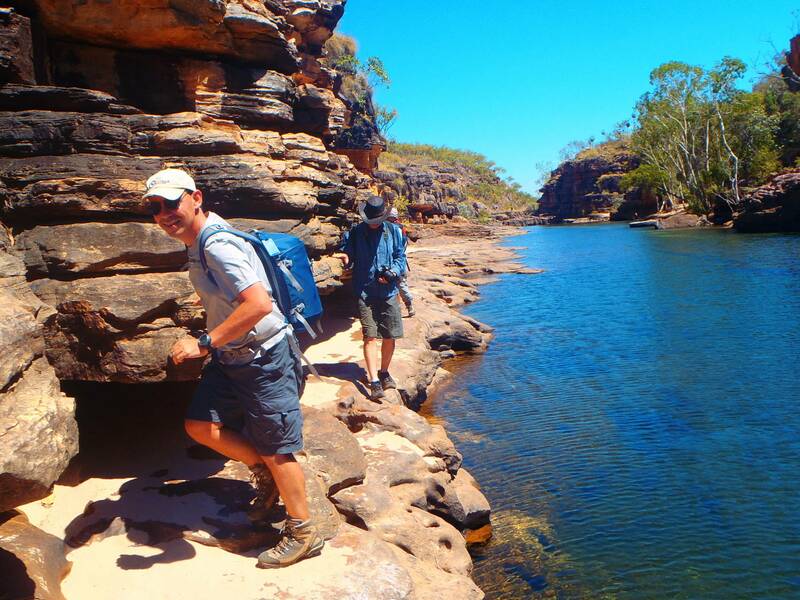 We begin our 5 Day Kakadu Koolpin Gorge Safari departing Darwin at approximately 6.30 am. Drive to Kakadu via the old Jim Jim Road stopping off at white lily billabong for a stretch and some morning tea. falls that leads to a large plunge pool. Tonight we camp at Gunlom by the waterfall, away from the crowds & under the stars. Showers and toilets are available. 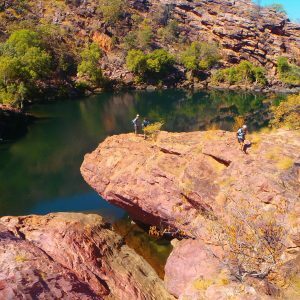 Today we spend the whole day exploring the magnificent Jarrangbarnmi (Koolpin Gorge), this is a special permit access area that is recognised for its cultural and environmental sensitivity. 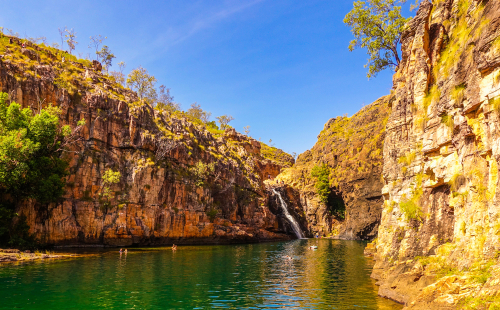 Koolpin Gorge is in the southern corner of Kakadu National Park, not far from Gunlom Falls. 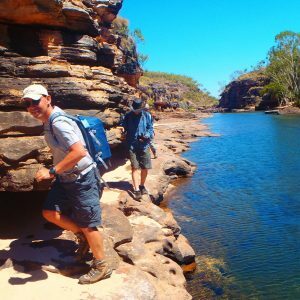 The walk up the gorge is a real wilderness walk and requires a good level of fitness with great rewards on arrival to some of the National Parks most spectacular rock pools, waterfalls and rock landscape. This remote location is restricted to only 40 people per day and it home to a number of endemic species of fauna. Return to our camp at Gunlom and tonight we enjoy a dinner cooked on the campfire. 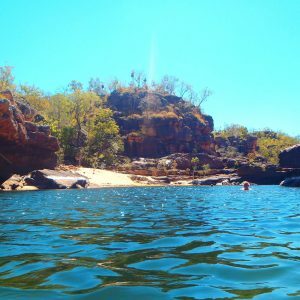 This morning we drive north to Maguk (Barramundi Gorge) where we have the entire day to hike, explore and swim in beautiful swimming holes, avoiding the crowds. A 4-wheel drive adventure takes us to our destination. 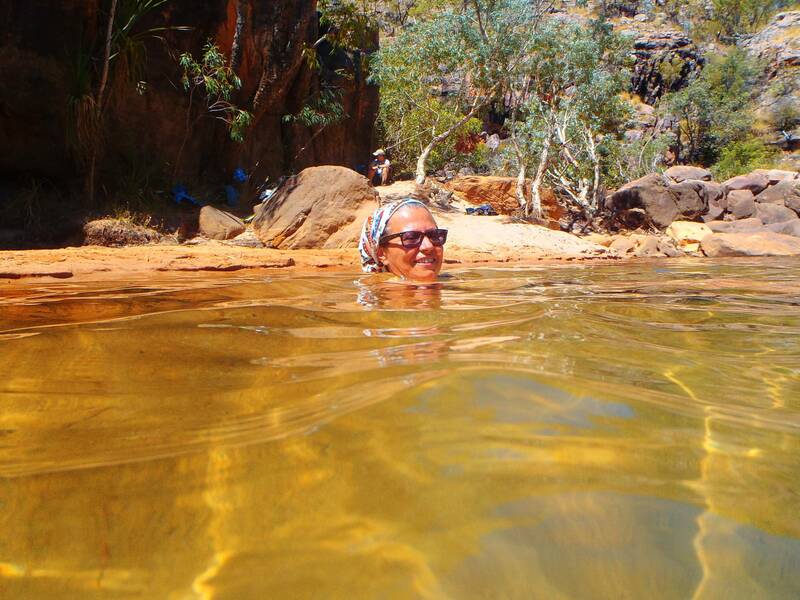 Upon arrival we take a 1km walk through paperbark and monsoon forest then along a sandy and rocky creek to a small waterfall and that lead us to a beautiful clear plunge pool. There are small interconnected pools among the rocks that flow into a small lake. 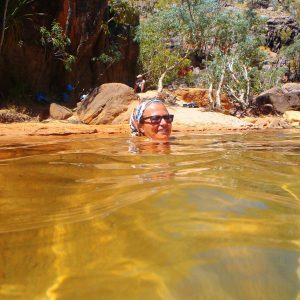 The guide will share a few secret swimming holes here including a little secret passage under water connecting two pools. Here we will also have lunch then a bit more exploring before we make our way further north to Jim Jim Falls. After breakfast we do some 4 Wheel driving to Twin Falls. From here we take the escarpment walk to the top of the falls for a swim in the crystal clear pools away from the crowds. Then we’ll find a shady spot by Jim Jim Creek for some lunch. 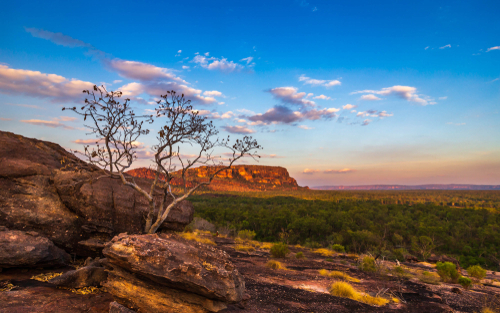 A short climb up Budjimi Lookout will reward you with spectacular views of the ancient Arnhemland escarpment. After lunch, a 1km walk through monsoonal vine forest to the base of Jim Jim Falls for a relaxing afternoon swimming in the plunge pool and resting on the beach. Tonight we camp at Mardugal, Showers and toilets available. We replenish ourselves with the Great Aussie BBQ including a taste plate of Crocodile, Buffalo and Kangaroo. 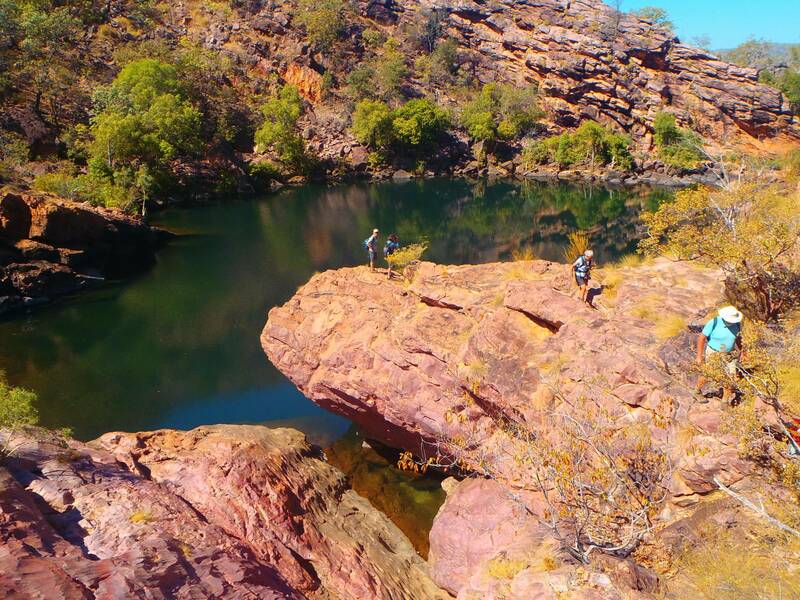 On the last day of your 5 Day Kakadu Koolpin Gorge Safari we begin with a visit Nourlangie Rock, an ancient aboriginal occupational and art site, here we can explore these sites before walking up to Gunwhardewharde lookout for an exceptional view of the region including Arnhemland. We then stop off to visit Bowali information centre. 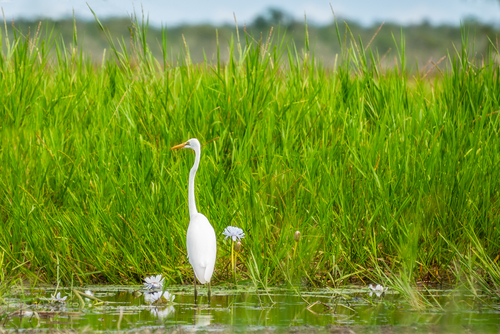 As we make are way back to Darwin we will call in to the Mamakala wetlands to see the incredible bird life. 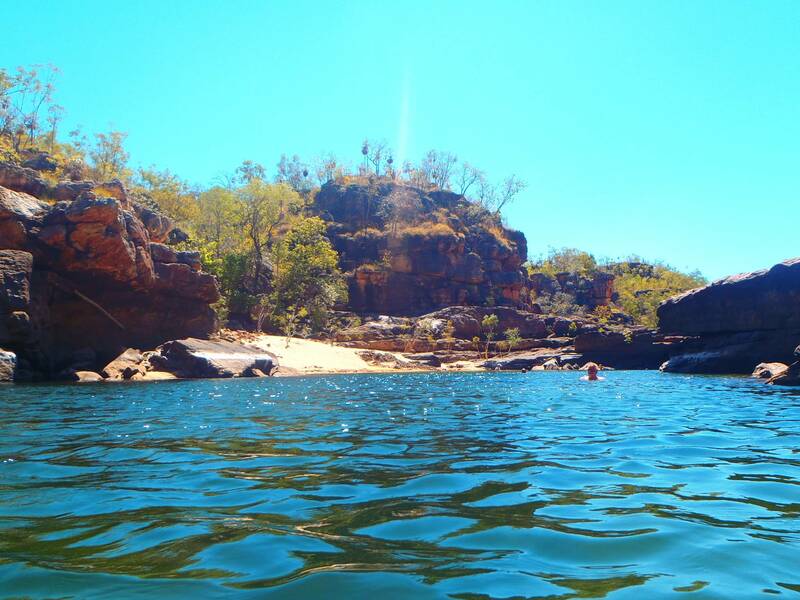 We finish our Kakadu tour with a wildlife cruise on the spectacular Corroborree Billabong. 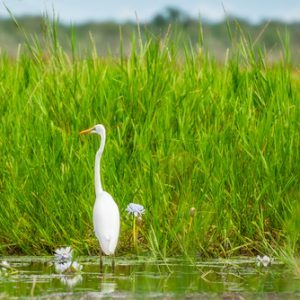 This is a great opportunity to get fantastic photos of the local wildlife. Head back to Darwin, returning at approximately 5.30 pm. 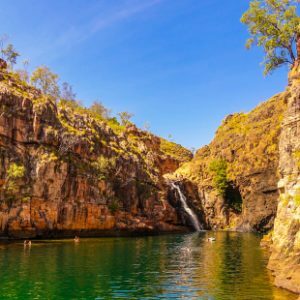 The 5 Day Kakadu Koolpin Gorge Safari itinerary is subject to change without notice due to seasonal and extreme weather conditions, national park road or attraction closures and cultural commitments from Traditional owners. Itinerary may be done in reverse at Guides discretion.